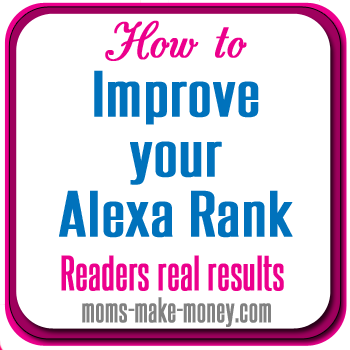 It’s that time when we take a look at our Alexa Ranking to see if we have made any improvement over last month. On June 12th, I wrote about the Alexa Ranking system and why it was important to bloggers. I recommended installing the Alexa Toolbar and see if this would improve Alexa Ranking. It’s time to look at the results. 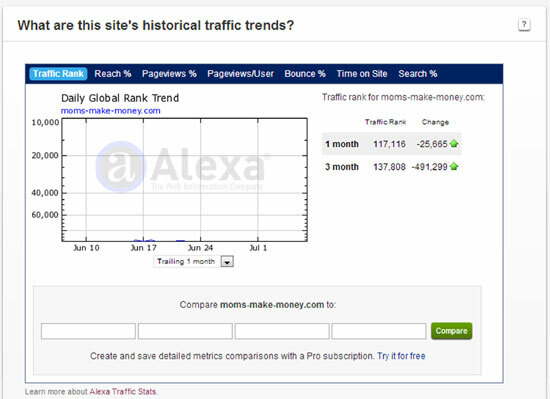 According to the post on 12th June, the Alexa Rank for Moms Make Money at that time was 189,490. I’ve been tracking this pretty closely since, and if you have been following the MMM Facebook Page, then you might have noticed when I posted a Milestone on the timeline. During the last month, the 3-month average for MMM went below 150,000 for the first time! All thanks to you, the readers and subscribers here that all participate in the success of the site with your comments and shares. But the rolling 3-month average figure isn’t the only thing you can track on Alexa. They also keep a score for the last 1 month too. So looking at this 1 month figure we can really see how the ranking has changed over the last month compared to earlier times and see if installing the toolbar has made any difference. As of today – here are the updated results for Moms Make Money. That’s a pretty nice improvement in ranking. You can find your results by adding your URL to Alexa.com and looking for this box. The 1 month and 3 month scores are on the right hand side. If you linked up and left your score in the comments back in June, do drop back to give us an update. Did you install the toolbar? Has your 3 month and 1 month rank improved? What’s the new score for 3 month and 1 month? And I’ll enter the results in the table here as they come in. Thanks everyone for taking part in this experiment. ‹ Why Google thinks your Blog Comment is SPAM	› Linky party buttons under attack by Google? Last time I checked, my score was ‘0’. Today, mine is 18,766,246. I guess that is an improvement since at least something shows up! Thanks for the help and tips! I have installed the toolbar as recommended. You’re the best – so glad I found you on Sverve! Since I added the toolbar I noticed that my alexa rank has improved too! It is nice watching those numbers go down. My alexa rating was 2 million something since my blog is on the newer side. Since then it has dropped down to 1,444,307. It is a very nice improvement! Thanks for sharing. It’s always good to hit a new milestone. You’ll be under a million before you know it! HI Deby! Back in June my Alexa Rank was 3,240,318 and the US rank was 604,054. Today it’s 1,807,027 and the US rank is 226,006. I just installed the toolbar today. Thank you so much for this great info! Great increase – just look at that 1-month figure for the results over the last 30 days – awesome! I’m really looking forward to seeing what it does next month. When we first posted our ranking mine was 21,813,914, now it is 3,869,034! Yay! Way to go Tania! Amazing improvement. I changed a few things on my site- so i don’t have anything past the 3 month mark. right now it is 961,000 ww and 343,000 us. i know this is down from the first check…but didn’t write it down. The site looks great Becky. Thanks for sharing your results. I was wondering about quilting and your site looks so bursting full of resources. Right now I just make clothes, but I do love the look of all the glorious quilts I see online – I’m not sure I have the patience for a big project. But I’ll be dropping by to see what I can learn and look for a weekend project one day. Once again, another really helpful post! Thank you! Just pinned this and I am going to see what happens when I install the toolbar. Following you on bloglovin now! I quite agree – traffic is much more important than the ranking and it is by no means an accurate way to compare one site to another. But its nice to track site metrics and having a good score is just one of the things you can promote in your media pack or on your advertising page to try to attract sponsors. Every time mine reaches a new milestone, it feels good to record that the site is growing or improving in some way. I couldn’t find how to get both 1 month and 3 month. As of today (almost a week plus one month), I am 8,277,466. It’s down 2,224,906. That’s progress, right? I couldn’t download the toolbar for Safari. 🙁 I could download Chrome and the toolbar, but I don’t know if that will help me if I am not normally going to use Chrome. Or will it? What is your recommendation? Thanks so much for linking up at Creative Wednesdays with Pink Recipe Box! I can’t believe I haven’t even heard of Alexa before. I definitely need to look into it now! Very interesting! I need to check this out. I just installed the alexa toolbar. Thanks for the tips …. Definitely something big has affected my global ranking and I’m not able to figure it out. Have you suddenly had a lot less traffic than before? Or had one or two really popular posts last month that have now trailed off? Alexa is basically a traffic tracker, so perhaps the profile of your visitors has changed. Last month you were getting more visits from browsers with the toolbar and this month, not so much. It’s a bit of a mystery!